Welcome! We'd like to show you around the Davis Family Funeral Home, including our new chapel and florist center. These photos help show our comfortable, family friendly environment - and a virtual walkthrough is coming soon - but nothing compares to an in-person tour. So please feel free to stop by 113 South Osage (Hwy. 75) in Dewey, Okla., to see it for yourself. Our spacious multifunctional room can comfortable seat 100-150 people for chapel, "Celebration of Life" and memorial services. It's also used for receptions, social gatherings and visitations where family members welcome friends and visitors, and share precious memories with one another. When we started Davis Family Funeral Home, we wanted it to not only be a source of care for local families, we wanted to be a source of information and education about the funeral options (burial or cremation) available to them. Our showroom is an open, accessible space with a display of caskets, urns and other merchandise that have prices clearly marked and full details about what the pre-arranged funeral packages include. Our families are encouraged to use the comfortable seating area and kitchenette where they can make fresh coffee and rest throughout the day. Also, during scheduled Family & Friends visitation hours, the funeral home will provide complimentary cookies for the family's guests - usually several dozen Otis Spunkmeyer cookies that are freshly baked, but also store-bought cookies when those run out like they sometimes do! Some families also choose to bring their own snacks and finger foods for a light meal. As an extra convenience to visitors, Davis Family Funeral Home has fresh potted plants available to buy and give the family immediately. This is especially helpful during weekends. We also work with Ramona Flowers in Dewey and all major local florists. Online orders for flowers and other thoughtful gifts can be placed anytime through this website - this allows you to see exactly what you are ordering before confirming your online purchase. Monuments are a permanent memorial for your loved one and what they meant to you. A variety of upright monuments and flat markers are on display, with additional granite color samples available in our showroom. The consultation and drawings are always complimentary. Orders are placed only after you've satisfied with the drawing, and with a 50% deposit. Left photo: Our Cremation Center has a display of cremation caskets, as well as a variety of full-sized and miniature keepsake urns. Right photo: Browse the Burial Center for a selection of steel and wood caskets to suit different tastes and budgets. Each casket is available for purchase as funeral merchandise, as well as part of an all-inclusive funeral package. 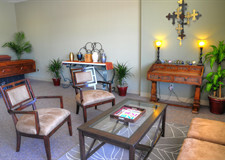 OUR PRIVATE FAMILY SUITE includes a living area, and a dining-kitchenette area. - Larger public space that's ideal for social interaction, whether it's a gathering of extended family and friends, or a quiet gathering of close friends and family. - The kitchenette, complete with microwave and mini-fridge, is ideal for serving snacks and light refreshments.